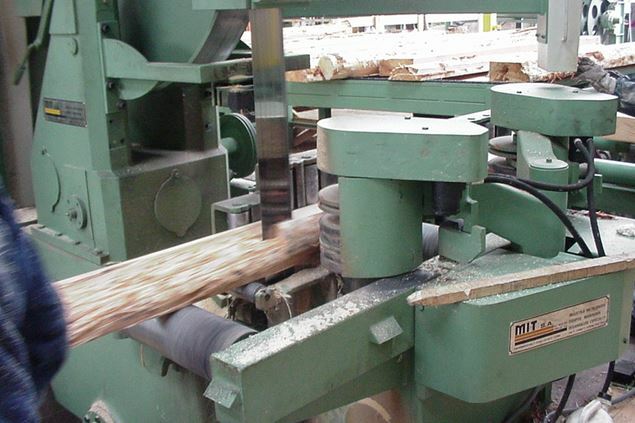 MIT has five models of their Vertical Band Resaw to cut varying widths and heights. The 1275 model uses a 6" band and has a 4'2" wheel. These resaws come with a line bar, variable hydraulic feed from zero (0) to two hundred and thirty (230) feet per minute, a live roller table with four (4) 6 ½ inch rollers, cartridge type pressure guides with the lower stationary, upper moveable, operator controlled, single or double hydraulic hauling and press roller drums, yoke and flywheel pistons of cast steel, air strain system with heavy duty air bag, using hydraulic hose for long lasting service and virtually no maintenance except for draining, electric motor activated system for raising and lowering flywheel, all systems are complete with valves, motors, cylinders, hoses, and controls, hydraulic system complete with tank, motor, pump, hoses, and valves, programmable measuring system using MUDATA microprocessor with ten position program and infinite variable parameters, and a main drive.